International trade growth can be an economic foundation for sustainable development. However the Addis Agenda, notes that trade growth must be inclusive and consistent with sustainable development. The Addis Agenda, the 2011-2020 Istanbul Plan of Action for LDCs and the SDG target 17.11 pledged to double the LDC share in global exports by 2020. Between 2011 and 2016, LDCs’ share in world merchandise export, in fact, decreased from 1.1 percent to 0.9 percent. Developing countries have continued to increase their share in international trade in the past 15 years. In world merchandise exports, their share has increased from 31 percent in 2001 to 44 percent in 2016, always maintaining an overall trade surplus vis-à-vis the rest of the world. LDCs’ share in world services trade remains insignificant, at 1.7 percent of world services import and less than 1 percent of world services export. Developing countries’ exports (imports) in services accounted for 29 percent (37 percent) of world services trade in 2016. Their share has constantly increased from 21 percent of world exports (26 percent of world imports) in 2001. The Addis Agenda recognizes the need to increase value addition in developing countries’ exports, i.e. scaling up in the stages of production from raw commodity to manufactured/processed products. The degree of export concentration in products can be a proxy to measure the degree of value addition and we present the export concentration (Hirschmann-Herfindahl) Index of developing countries, LDCs, LLDCs, and SIDS. Exports of LDCs and LLDCs remain highly concentrated. Taking into account the majority of LDCs’ and LLDCs’ exports consist of primary commodities, the changes in the annual degree of export concentration is compared to the price indices of minerals/ores/metals and crude petroleum. LDCs’ and LLDCs’ export concentration in the years between 2003 and 2008 coincided with the rapid rise in commodity prices. There is a clear positive correlation between the commodity price changes and the degree of export concentration of LDCs and LLDCs especially in the period towards 2009. An increase in geographical diversification, i.e. an increase in the number of trade partners, indicates an increase in a country’s integration into international trade. The figure presents intra-group trade of these groupings - how much countries trade with others in the same country groupings. In 2016, intra-European exports amounted to 69 percent of total European exports. The figure for sub-Saharan Africa was around 20 percent. The Addis Agenda recognizes the importance of fostering integration of MSMEs, which constitute the backbone of developing economies, into value chains for achieving inclusive trade growth. According to the World Bank Enterprise Surveys, SMEs accounted for two-thirds of formal non-agricultural private employment. Their participation in trade, however, is not in line with their economic weight at the domestic level. Direct exports are estimated to represent just 7.6 per cent of total sales of SMEs in the manufacturing sector in developing countries, (0.9 per cent per cent of total services sales), compared to 14.1 per cent per cent (31.9 per cent per cent for services exports) for large enterprises. SMEs in the Balkan region as well as those in the Middle East have the highest proportion of direct exports in the manufacturing sector. E-commerce, or the buying or selling of goods or services online, is transforming the global business and trade landscape at an unprecedented speed, opening international trade opportunities that most developing countries have yet to fully grasp. Cross-border e-commerce today accounts for 12 per cent of globally traded goods. However, the proportion of internet users purchasing online is still very low among developing countries. In the past two decades, there has been an increase in the share of regional trade agreements (RTAs) that include labour provisions. In 2017, about 30 per cent of all trade agreements—or 84 agreements—included labour provisions, up from 7.3 per cent (or 3 agreements) in 1995. A large share of trade agreements with labour provisions are North-South agreements (approximately 70 per cent), but about 25 per cent of such trade agreements involve only developing and emerging economies, with Latin America and Sub-Saharan Africa being particularly active (ILO, 2016a). It is generally accepted that trade and investment are necessary but not sufficient conditions for inclusive development. Trade growth and aggregate economic development are strongly and positively correlated, while the relationship between trade growth and inequality is weak, but marginally positive (ESCAP Asia-Pacific Trade and Investment Report 2017). FDI growth exhibits similar, although weaker, relationships with both economic development and inequality. In turn, trade growth and FDI growth are both relatively strongly and positively correlated with CO2 emissions. This is explained by the fact that the increase in economic activity associated with international trade and investment tends to put more pressure on the environment and the limited stock of natural resources. Taken together, these simple correlations illustrate the need for policymakers to take proactive actions to channel trade and investment into activities and sectors that can help mitigate the environmental and social impacts while still capturing the economic benefits. 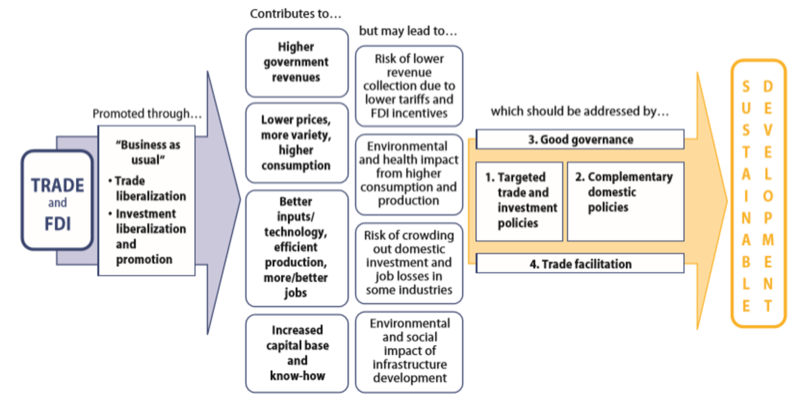 ESCAP (2017) estimated the effects of various trade and investment liberalization scenarios in Asia and the Pacific when combined with domestic social and environmental policies on economic growth, trade, CO2 emissions, inequality and undernourishment. Specifically, the effects of emission reduction commitments under the Paris Agreement, as well as of domestic income transfers from skilled to unskilled labor in Asia-Pacific countries are analysed, as example of complementary policies needed to channel trade and investment into sustainable development. The figure revealed that an integrated approach to regional trade and investment liberalization and facilitation in Asia and the Pacific yields substantial benefits, boosting trade by over $175 billion annually and helping to address undernourishment. However, the analysis also confirms the need for complementary social and environmental policies to better channel trade and investment into sustainable development. Indeed, while the social and environmental impacts from liberalization are typically not large at the regional level, they vary substantially across subregions in both significance and direction. Importantly, the combined effect of integrated liberalization, domestic welfare transfers and global Paris Accord implementation is a higher level of economic growth in Asia and the Pacific than what is achieved through integrated liberalization alone, while inequality and CO2 emissions are also mitigated.